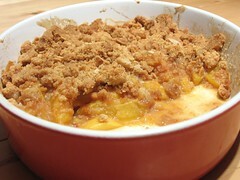 Peach Crumble - Do You Know The Muffin Man? Notes: There are two interesting techniques in this recipe: one is to macerate the peaches in sugar beforehand, to release excess juices and avoid a runny filling; the other is to prebake the crumble so that it stays crisp. Both contribute to a delicious result: the peach filling is just right, not too thin, not too thick, and the topping stays crispy. A great way to highlight this fruit.